Whippets are the best kept secret of the dog world: they look like exquisite miniature greyhounds, are the ultimate racing machine and the ideal pet. Enjoy pictures, info and stories about these lovable dogs. Meet the Whippet of the Day! Click here to read the story and leave your comments about the picture. Search your drawers, look through your computer and send us your best shots, we are waiting for your favorite pictures, brag freely about your dog here! This small sighthound is at the same time a perfect companion dog and a passionate hunter. Discover in our website how it feels to share your life and sofa with these wonderful miniature greyhounds, the fastest couch potatoes on earth. In our pages you will find all you ever wanted to know about these hounds: how they look, how they behave, how to find rescue organisations, reliable breeders and how to train puppies of this amazing dog breed. I love to take my dogs with me wherever I can because they are well behaved and very social. They enjoy walking, seeing new places and being around people as much as I do. They are so graceful and elegant that when I walk with them I often get stopped by strangers who ask me questions about these stunning hounds and want to pet them. My dogs seem to enjoy the attention, they are happy to be petted and act as consumed ambassadors for the breed. People ask me questions about this unusual dog breed, about its temperament, attitudes and health and, I must confess, I love to share what I have learned living for many years with these wonderful dogs. This website will try to answer the questions I am asked during our walks. In these pages you’ll find a wealth of information about these miniature greyhounds. Find out about puppies and rescues, learn how to raise and train these lovable dogs, receive free vet advice, enjoy great dog art and photos from our visitors. If you already have one or many of these little hounds in your life and you would like to share their pictures, don’t be shy, we are waiting for your favorite photos! Years ago my family and I fell in love with this beautiful dog breed: look at the pictures, read our pages and you will understand why. Visit our website and, I am sure, just like it happened to us, you too will fall in love with our beautiful whippet dogs! I have been to many different on line sites about whippets and I must say yours in absolutely the BEST! Friendly, warm, personal and fast....sounds like a whippet to me! I am very much enjoying my daily visits to your site and the education it has given me about this beautiful breed we all love so much. Thank you for all your efforts and God bless! I wanted to find out about this dog breed and your website was so informative! It´s clear just how wonderful these dogs can be! Thanks! Hi, I just love your website! You have great information and fun contests! There are fun stories and poems and a bunch of awesome stuff! Great work with this awesome website! 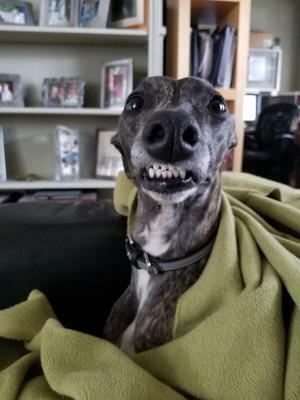 I love your site, it is hands down my favorite whippet site ever! It's made by people that love their dogs as much as I love my baby girl. You guys rock! Love your site - very well put together, easy to follow and full of all kinds of information not found elsewhere!